Tebow-Mania: Is Tim Tebow MVP Worthy? Denver Broncos Quarterback Tim Tebow may not be a Top-15 player at his own position, but in the Mile High City, he is just what the doctor ordered. I for one was not an original “Tebow-Maniac” like many fans currently are. At the start of the year, Tim was deemed to be the third-string Quarterback for the Broncos, behind mediocre passers in Kyle Orton and Brady Quinn. With horrible Quarterbacks ranked in front of him on the depth chart, what was I to think about Mr. Tebow? I knew once he was drafted back in 2010, that he was going to be a project. He would be a work in progress and not the kind of player that you could put out on the field day one and expect greatness. His skill-set prevented him from being that type of Quarterback. He had below-par throwing mechanics entering the NFL, and in a now passing-oriented league, that was going to hold him back. At least, I thought it was going to hold him back. The Denver Broncos began the season on the lowest of notes, losing 4 of their first 5 games. Kyle Orton was only completing 58% of his passes, and had accumulated more turnovers (9) than touchdowns (8). With Brady Quinn absent from the team to be with his ailing girlfriend, Tim Tebow was the only available QB after Coach Fox benched Orton. After trailing by 16 points against division rivals the San Diego Chargers in week 5, Tebow was able to get 14 points back on the board before eventually falling to the blue and yellow 29-24. In his one half of play, Tim went 4 for 10 through the air for 79 yards and a touchdown. He also rushed for 38 yards and got another touchdown on the ground. His performance was good enough for Fox to name Tebow the starter for after the bye week, which made Denver fans extremely happy. 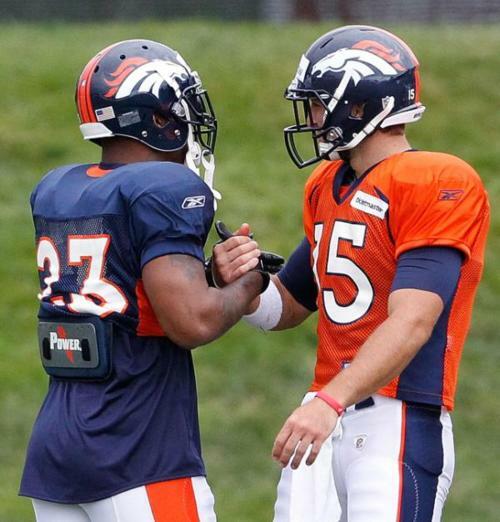 Since the bye, Tebow has led the Broncos to a 5 game-winning streak, as well as victories in 6 of their last 7 games. 4 of those wins were comeback victories. After weeks of pining, yelling and chanting for Tebow to be the starter, the fans of the Broncos have had their wishes granted. Not only is Tim on the field, but he is winning football games, and has the Broncos in a prime position to win a division title and make a playoff appearance. I can see why everyone loves Tim Tebow. He is the kind of player you would want leading your franchise, at least personality-wise. He is a devoted christian, has had a good family upbringing and all of the ladies love him. He has a good head on his shoulders, and despite all of the criticism he has received (even from team president John Elway), he has stayed strong and continues to push forward with his teammates. To be fair though, the criticism and critiques of his individual performance are all justified. If you look at some of the numbers Tebow has put up in recent games, you would be shocked to find out that the Broncos were victorious in all of them. In the NFL, the success of a team begins and ends with the Quarterback. If your QB isn’t producing, then odds are you won’t be winning a lot of games. Tebow isn’t exactly going to be compared to a Drew Brees or Tom Brady any day soon with passing numbers like that. To be fair though, his lowly statistics through the air haven’t hurt the Broncos, at least yet. On the year, Tim has completed only 47% of his passes, but has 1054 yards passing, 10 touchdowns and surprisingly, only 1 interception. That also includes his incredible running numbers of 468 yards and 3 touchdowns. On many highly acclaimed Sports Talk Shows like Around The Horn, Pardon The Interruption and Sports Nation, the question of whether or not Tim Tebow should be in the running for MVP votes was brought up as a topic of discussion. Some analysts believe that Tebow could be the MVP if the title of “Most Valuable Player” was taken literally instead of the usual “who is the best player in the league?” way of thinking. 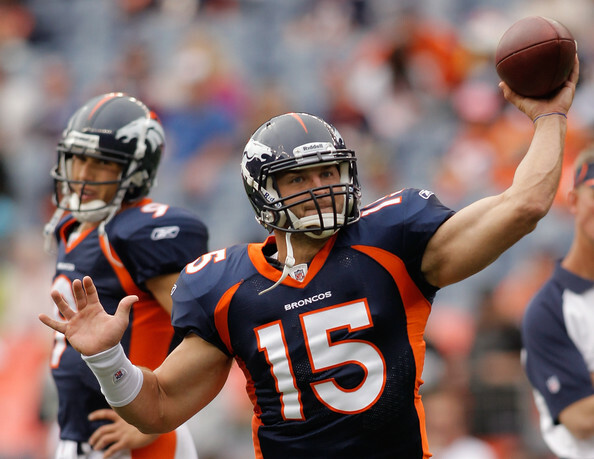 Let’s get one thing straight off the bat….Tim Tebow will not win the MVP this season. That isn’t a knock on how he has played or performed, but the MVP will be going to Aaron Rodgers or his NFC counterpart Drew Brees. Tebow may swing 1 or 2 votes from some delusional voters, but he has no realistic chance of winning the award in 2011. Yes, there may not be a more valuable player to their team in the National Football League than Tebow is to the Broncos. Before he was named the starter, the team was 1-4 and doomed for a losing season. Since his arrival, Denver has been 6-1 and now sits atop the AFC West. But even though Tebow has been a revelation for the Broncos, his performance should not take away from what the other important parts of the team have been accomplishing this year. Running Back Willis McGahee has found new life in the Mile High City, rushing for almost 5 yards a carry, 886 yards and 4 touchdowns. The Defense, led by rookie Von Miller and Champ Bailey, has also stepped up as well. They have held opposing teams under 15 points in 4 of their last 7 games. Coach Fox also deserves a pat on the back as well, for developing an offense that hides the weaknesses of his game and allows him to run the team in a way where his strengths as a player are put in the spotlight, like his ability to run and his big arm. So while Tebow does deserve a lot of credit for how the team has been doing, let’s not give him all of the glory just yet. Without the continued improvement of the Defense and the re-emergence of Willis McGahee, this team doesn’t win 5 games in a row. I used to be a huge hater of Tim Tebow. I found him to be a sorry excuse for a Quarterback who was finding new, exciting and flukey ways to pull out wins. I have changed my tone a bit though. I just have a problem with fans and analysts who have chosen to put this kid on a pedestal, and make him appear to be gods-gift (no pun intended) to Denver Football. 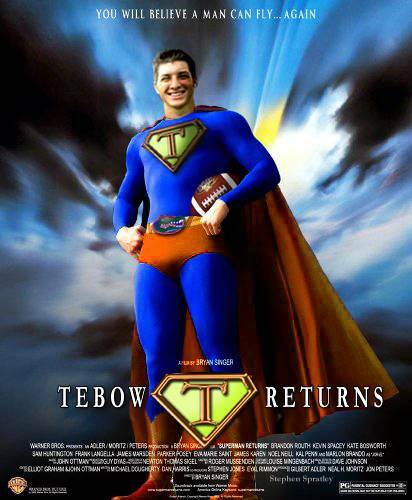 I think over time, teams will figure out Tebow’s game and the huge success he has been having will come to a halt. He has many holes in his repertoire that can definitely be improved upon, so I will give him the benefit of the doubt on that. I would give any other QB the time to grow as a player and fix their game, and Tebow will be no exception. Tim has had an incredible year. He isn’t even CLOSE to being considered an upper-echelon Quarterback in the NFL, let alone a candidate to win the MVP award. Can he be that kind of player 2-5 years from now? Absolutely. He has the drive to become a better overall QB, and I believe one day he will be. He can’t just be a running QB forever. If he adds a more effective passing game to his resume, watch out. The future looks bright. What are your thoughts on Tim Tebow this season? Has he played at an MVP-type level? What kind of future do you see Tebow having in the NFL? Leave a comment below and tell me what you think. This entry was posted in NFL and tagged Denver Broncos, NFL, Tim Tebow. Bookmark the permalink. 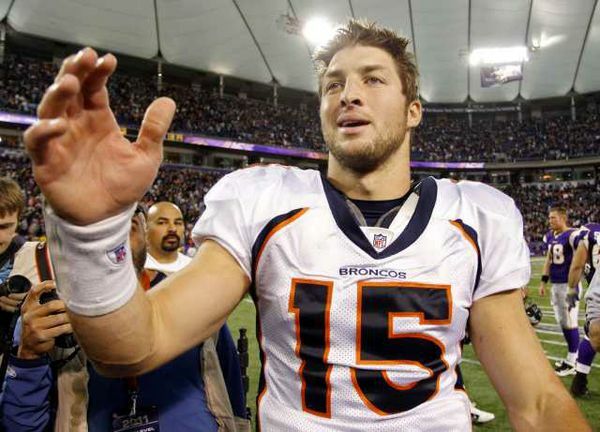 3 Responses to Tebow-Mania: Is Tim Tebow MVP Worthy? I love the kid. But I’m not gonna get ahead of myself here. As you said, if MVP was “most valuable to his team” than Tebow would be in the running, but as it is really the award for “best player” it has to go top Rodgers or Brees. I think that if Denver makes the playoffs (lets not even talk about winning playoff games, yet), or even finishes with a winning record, they need to name Tim the starter so they can work all off season to make him better and build around him. As of right now, though, I’m stoked to have Tebow as the starter for my team, and prefer him over even Sam Bradford, he makes games exciting and is helping Denver make a push for the playoffs. Watching any Broncos game with less than 5 minutes left, down by a TD or less, and the ball in Tebow’s hands is just awesome.